I love greens and make it a point to prepare greens at least 4 days a week as I strongly believe that we are what we eat. Here, we have methi (vendaya keerai) season now and we get fresh greens at our doorstep. So here I am with another methi recipe. I prepare methi rice in two ways - One is this onion tomato base and another is Vendhya keerai sadam using South Indian masala. Both are very tasty and delicious and a great way to include greens in our diet. Do try this and you will love it. You can also pack it for lunch with any raitha/pachadi as side dish. Add all the spice powder given under 'spice powder'. Add needed salt , 2 cups of boiling water, rice and cook covered. Tips - to check if the salt added is right, taste the water and see. Serve it hot with raitha or chips. It taste heavenly. yummy looking rice...and healthy too...and the tomato basket looks so cute. beautifully made Padhu. love methi pulao. Such a healthy and yummy rice...love it..
very healthy dish,have not tried methi in rice so far,must try.very cute tomato carving too! I love this very much..very nice recipe! Looks so delish wish i had this for dinner. Looks nice Padhu. Half the time I forget that there are simple and healthy recipes like this I can make in no time. Good to be a part of blogging world. wow..thats was healthy n yummy combo padhu..happy ponggal! 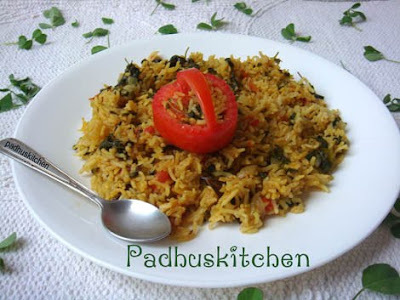 Methi pulao looks delicious nice recipe. Very nutritious and I find this very aromatic also...that's a cute tomato basket Padhu. Nutritious and yummy pulao,tempting dish. Got to try the pulao version with methi, this one looks yum! Never tried methi pulav before..Looks healthy and yummy..
Looks delicious... I love pulao and this has made me hungry!! You make it awesome Padhu! I love the flavor of methi leaves so much and you add another tasty dish in my menu! The methi pulao looks yummy!! You have a lovely blog and thanks for visting my blog!!! your rice dish sounds so good and healthy. This recipe was fantastic! 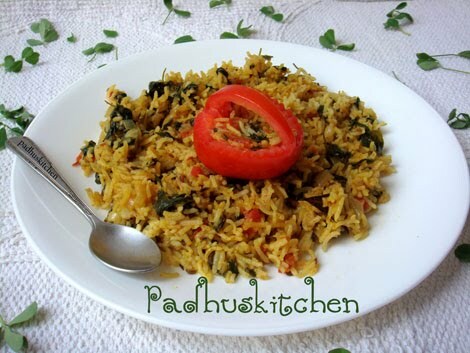 I had a hankering for Methi Pulao after tasting it in India years ago. I worried that the conventional measurements would be off (as I have often experienced with "by eye" cooks turning their food into recipes), but it was perfect! Honestly, some of the best Indian food I have ever made at home and super easy. Thanks for sharing! I'll have a look at other recipes on your site. Very very simple and tasty recipe. Adding boiling water is an amazing trick to keep methi from turning bitter! Thanks for sharing! Wow...a tasty and relishing recipe using healthy mehti leaves....Thanks!!! Im a big fan of almost all of ur recipes..I have tried many of them as well..It has always come out really well as well..:) love ur recipes..seem so simple when compared to many others..I have bookmarked and saved in favourites many of the recipes I tried and tested..thanks a lot for padhuskitchen.. I am an avid reader of your food blog. I have tried several recipes and experimented with them as well. Today my daughter begins her full day school and like every working mom I had this challenge of making a healthy, nutritious and fresh meal for her. I made this pulao today and it tasted awesome, more for the simplicity and practicality. I must say, I made the masala yesterday and stored it in the fridge. Just made rice in the morning and mixed it well. Saves a lot of time. Thanks for your innovative ideas! Fresh methi should be used for this rice. Dry methi leaves for this recipe will not be good. Tried this pulao, it was so tasty and yummy. Thanks for this wonderful recipe. Yes, at least approximately though not exactly. I have tried some of your recipes and turned out very yum. Thanks for your recipes. Today I just wanted to try something new with methi and loved your simple recipe. But I didn't have ripe tomatoes, so for sour taste I added lemon juice before closing the lid. (For most of the recipes, I use lemon if sour tomato is not available). It turned out very well. I have one doubt what is the measurement of 1 cup you mean? Thank you so much Saras for your nice comment. I use standard measuring cups and spoons for all my recipes. Check my measuring spoons and cups . I have tried most of ur recipes.i have one doubt.instead of fresh methi leaves can I use dried one. I tried this many times. Very delicious. It might be due to the rice variety. Try changing the rice.